A new railway station has opened in West Yorkshire as part of a £15.9m rail improvement scheme. Kirkstall Forge Station, which is three miles outside Leeds city centre, will be served by trains on the Leeds to Bradford line. One train per hour will call in each direction, with additional services during peak hours. 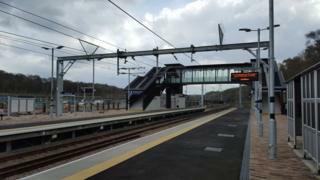 It is the second new station to open in the county after Apperley Bridge Rail Station opened in December. The station is located close to the 57-acre Kirkstall Forge Development, where there are plans to build 1,050 new houses, 300,000 sq ft of offices and 100,000 sq ft of retail, leisure and community space. Leader of Leeds City Council Councillor, Judith Blake said: "The station has a key role to play in realising the major regeneration potential of the broader Kirkstall Forge development, bringing with it new jobs, training opportunities, housing and a range of office and leisure facilities to offer a significant boost to the local economy." Funding for the stations came from primarily from the Department for Transport, which invested £9.5m. Further contributions of £5m came from the private sector, as well as additional monies from the West Yorkshire Combined Authority.